Incorporated Name: Doctor's Associates, Inc. Since its founding the SUBWAY® franchise system has experienced phenomenal growth, and has become the #1 Quick Service Restaurant chain in the world. In most years, about 70% of new franchises are purchases by existing owners. The SUBWAY® décor integrates the look of natural building materials - brick, clay, stone - into the stores and conveys to customers that SUBWAY® locations are warm and inviting family dining destinations. SUBWAY® “Sandwich Artists” create customers’ sandwiches on a varied selection of daily baked gourmet breads. With the option of many ingredients, the sandwiches are customized with an array of meats, cheeses, vegetables, and lastly topped off with unique select sauces. In addition, many food flavors are brought out by toasting the sandwiches to perfection, just the way a customer wants. The SUBWAY® franchise offers your customers many great options to eat a fresh meal, fast. Think about your customer base and all the potential consumers who patronize your business. Wouldn’t the quality of the SUBWAY® products appeal to those consumers? The nutritional value of our food is very important. The SUBWAY FRESH FITTM menu is low in saturated fat and cholesterol and is trans fat free. Training: You and your designee or manager will take part in our intensive two-week program. Restaurant/Store Design: You will be provided with floor plans for your specific location. Site Selection: You will be assisted in evaluating the location for your business. Equipment Ordering: You will receive guidance on ordering your equipment package for timely delivery. Operations Manual: SUBWAY® restaurants’ in-depth manual covers a full range of topics important to running your business. Field Support: Your local representative will help you get started and provide ongoing operational evaluations. Franchisee Services: A Coordinator will serve as your main contact person, who is just a phone call or e-mail away. R&D: SUBWAY® franchise executive chef, baking specialists, staff nutritionist, and product development team continually strive to make our excellent food even better. Continuing Education: Regular newsletters, e-mails and voice-mails, DVDs and additional learning tools are also available. The SUBWAY® brand is committed to making SUBWAY® restaurants and operations as environmentally and socially responsible as possible. The brand strives to conduct business in a way that creates profit for franchisees while minimizing the impact the business has on the environment and improving the lives of SUBWAY® customers, employees, franchisees, vendors and communities world-wide. The SUBWAY® organization works on sustainable initiatives world-wide with a focus on energy efficiency, water and resource conservation, and waste reduction, as well as sustainable & ethical sourcing and supply chain management. In the US, efforts undertaken by the SUBWAY® brand together with vendors have eliminated 718,698 metric tons of greenhouse gas (GHG) emissions over the past year. Since August 2006, all new SUBWAY® restaurants and many remodeled locations have installed low-flow sink aerators; saving over 214 million gallons of water annually. Franchisees have the option to build Eco Restaurants designed to reduce energy and water usage, waste and conserve resources. To date, there are 14 Eco Restaurants open and more are being planned. To reduce the environmental footprint of the waste stream, the SUBWAY® brand strives to eliminate unnecessary packaging and to transition to more sustainable packaging where possible. SUBWAY® restaurants use napkins, gift cards, take-out menus, towels, tissues, sandwich wrap, paper hot cups, salad containers, catering trays, beverage carriers, pizza boxes, and catering trays that contain recycled content. SUBWAY® restaurants offer a variety of “better for you” menu items. The SUBWAY® brand is committed to continually improving the nutritional content of the food served. All artificial trans fats have been eliminated from core products. The sodium content has been reduced by 28% for low fat sandwiches and by 15% for all lunch and dinner subs. In the US, the bread is fortified with calcium and vitamin D, and chicken and turkey are antibiotic and hormone-free. 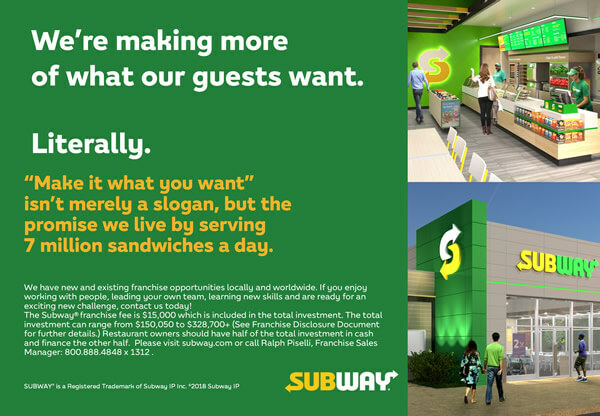 Subway® is currently accepting inquiries from the following states: Alabama, Alaska, Arizona, Arkansas, California, Colorado, Connecticut, Delaware, Florida, Georgia, Hawaii, Idaho, Illinois, Indiana, Iowa, Kansas, Kentucky, Louisiana, Maine, Maryland, Massachusetts, Michigan, Minnesota, Mississippi, Missouri, Montana, Nebraska, Nevada, New Hampshire, New Jersey, New Mexico, New York, North Carolina, North Dakota, Ohio, Oklahoma, Oregon, Pennsylvania, Rhode Island, South Carolina, South Dakota, Tennessee, Texas, Utah, Vermont, Virginia, Washington, West Virginia, Wisconsin, Wyoming. Subway® is also currently accepting inquiries from Canada.